The excess kilograms of weight in our body is one of the most disturbing things to look at every day. Life becomes more difficult as well as confusing at the same time with two thoughts simultaneously hovering in mind. One that says love the way you are, while the second one that says you got to be fit and healthy. Well, if you consider our suggestion, better take up a way that goes from the middle of both the paths. Help yourself to attain fitness while you keep loving your more every moment. And, if you fall short of ideas on how to do it, we have some of the NutriBullet recipes for you which aid you to lose those extra pounds of weight. After all, a fit physique is the best gift we can give to our bodies. Every good habit requires shunning a bad habit. While you get to gear up and head towards a healthy lifestyle, the most comfortable solution seems to be the most prominent one. And when it comes to weight loss, this feasible solution is about looking for something like dieting, some shortcut tricks, and a lot more like these. The healthy NutriBullet recipes are some of those shortcuts that assist you in that weight loss process. The world now has drastically become health conscious. And, this health-driven approach to the things has concrete ways for innovations and ideas that have transformed the existing ones into something beyond perfection. One such change in the grinding technology is what we know as NutriBullet. Basically, an advanced form of grinders, NutriBullet blender/mixer helps us to use the food for the purpose it is meant for, i.e., nutrition in a more efficient way. In other words, it is something that helps you extract all the possible nutrients from the food with the BPA free high-speed technology base. Thanks to the cyclonic actions of the patented blade design, they help you break down the ingredients in the best possible way while maintaining their nutritious value and making them more absorptive. The principle it uses destroys the external cell wall of the elements in it and makes it capable of delivering the nutrition value it possesses. Why Choose NutriBullet Over a Common Grinder? If you want to grind the food so well that it does not lose its nutrient value and ability to deliver the same to you, this is the best choice you can make from the options of grinders available in the market. 1. Price – Who does not want to get the maximum benefits at a price that is lesser or at least the same? Probably, no one. This is what makes NutriBullet one of the significant choices if you are looking for an affordable option in the range of grinders that delivers better or same performance. The price of NutriBullet is lesser when you compare it to most of its rivals in the market. 2. Versatility – Well, an inexpensive product that offers versatility, sounds impressive, isn’t it? If you are thinking that it is only capable of preparing delicious smoothies for you, you would be amazed to know that it is not so. You can also make fantastic soups, dressings, desserts, ice creams, dips, and sauces using NutriBullet. Not only these, but it can also help you grind the rice into flour, obtain nut butter from the nuts, and fine wheat flour from the wheat berries. 3. Liberty to Use Dishwasher for Washing Cups and Lids – Well, the hassle of hand-washing the things seems a tedious task. But the difference NutriBullet makes to it is that it gives you the liberty to wash the components on the top rack of your dishwasher. However, you need to keep in mind that the blades are not fit to be cleaned in a dishwasher. Nutribullet also comes with its fair share of disadvantages, but the pros of this product rise above all the negative aspects it possesses. Most importantly, the quality of the product does not degrade quickly. The first ingredient in our NutriBlast recipe is green tea. Those struggling with the extra kilograms of weight on their bodies must have recommended consuming green tea by their trainers, doctors, or probably merely a relative or friend with whom you share your problem. Well, not only the people but even science supports that green tea is pretty useful when it comes to weight loss and weight management (1). The other ingredients which are used in this NutriBullet smoothie recipe include broccoli, cauliflower, and pineapple, which have their proven benefits when it comes to weight loss (2, 3). This smoothie is made using green tea & vegetables and is useful in helping you to lose weight significantly while supplying only 68 calories in a large cup. There is a reason to why we have labeled it as a natural protein shake. It is because we are now obtaining some protein from our favorite natural sources to blend them into one of the delicious NutriBullet smoothie recipes. Some of the ingredients this smoothie possesses are pineapple, Kiwifruits, sweetened coconut, almonds, vanilla Greek Yogurt and coconut milk. The components have been studied scientifically to help for the weight loss in the people who are battling with the problem of overweight (4, 5). The protein shake we will be having in our hand after the preparation acts merely by helping us feel fuller for a longer duration of time, thus helping us cut down on our calorie intake. Not only this, but the ingredients also help us with their weight loss compounds, thus helping us to gain more out of one cup of the smoothie. The smoothie obtained will be sufficient for two serves. Single large cup of this smoothie will supply you with 190 calories, 5.6 grams of fat, 16.1 grams of sugar, 44.7 milligrams of sodium, 3.6 grams o fibers, 11.8 grams of protein, and is devoid of any cholesterol contents. As it is quite evident from the name, this smoothie is prepared using bananas and berries. According to a scientific study, the Native Banana Starch (NBS) played a vital role in the weight loss process of the people who consumed it, thus proving banana as an excellent fruit for the people who are struggling to lose weight (6). It is one of the mains reasons why people often use a fresh banana for the same purpose (7). In addition to this, another study proved that the high-fat mice which were fed with the fresh blueberry juice were able to lose weight at a rapid pace (8). It is the reason we are now combining both the magic weight loss ingredients to form a fantastic weight loss smoothie. This smoothie serves you the best when consumed before the workout session as it promotes muscle function and recovery. The ingredients will provide you with a smoothie enough for two servings. All you got to do is fill the NutriBullet grinder with the ingredients and grind it unless you obtain a smooth mixture. All you got to do is fill the NutriBullet grinder with the ingredients and grind it unless you obtain a smooth mixture. A large cup of this cholesterol-free smoothie serves you with 167 calories, 3 grams of fat, 14.7 grams of sugar, 74.6 milligrams of sodium, 5.6 grams of fiber, and 2.7 grams of protein. This smoothie is one among the list of low-calorie NutriBullet recipes for detox of your system. This bright color smoothie is made using the ingredients such as carrots, oranges, lemon, and unsweetened coconut milk. The researchers have highlighted the fact that presence of vitamin C in higher amount helps the body to oxidize the fats more efficiently as compared to the one who is suffering from low vitamin C in their bodies (9). This quality makes the citrus fruits such as lemons and oranges an efficient weapon to fight against the increasing weight. The other ingredient used for preparing this smoothie is carrot which is known to be used as a compelling alternative to weight loss, thanks to the less amount of calories it has (10). The number of elements mentioned above will serve you with two servings of the smoothie. A large cup of this smoothie contains 90 calories accompanied with 1.4 grams of fat and 11.3 grams of sugar. Besides this, it also provides 50.2 milligrams of fiber, 1.78 grams of proteins and zero cholesterol. The next alternate we have for you is to prepare a milkshake using ingredients like cantaloupe and blueberries. We have already discussed how effective blueberries are for weight loss; cantaloupe is no way lesser efficient than it. Cantaloupe is considered as one of the most abundant sources of vitamin C along with other nutrients such as vitamin A and folate (11). It not only makes the smoothie satisfying to the taste buds but also makes it an excellent ingredient to be used in the delicacies promoting weight loss. The number of ingredients mentioned above will help you prepare two servings of the melon and berry smoothie having a milk-like appearance. A large glass of this shake with supply the consumer with 117 calories, 3.5 grams of fat, 15.6 grams of sugar, 81 milligrams of sodium, 5.6 grams of fiber, 3.3 grams of protein and absolutely no amount of cholesterol. Another one on our list is the smoothie which is a NutriBullet fruit smoothie recipe, which we are going to prepare using the fruits that have vibrant red color. It is also one of the recipes that help your body to detox. It uses the ingredients including watermelon, strawberries, beets, and coconut to perform the desired functions. Watermelon is the summer favorite of many and supplies the body with essential water contents that help the body to stay hydrated in the summers. It is also rich in compounds, such as amino acids that help the arteries to function well and also ensure smooth blood circulation. In addition to this, the smoothie is also rich in the vitamin C contents and contains the electrolytes, thanks to the presence of coconut. A cup of Radiant Red Melon Smoothie has zero cholesterol and helps your body gain a calorie count of 183, 7 grams of fat, 6 grams of saturated fat, 26.5 grams of carbohydrates, 23.6 grams of sugar, 129 milligrams of sodium, 4.5 grams of fiber, and 3.1 grams of protein. If you are seeking a solution to obtain maximum nutrients from the fruits such as watermelon, berries, and chard, then this NutriBullet smoothie is the best bet for you. Enriched with 363 milligrams of potassium, vitamin A in a considerable amount, and a lot of vitamin C, the smoothie splash makes sure that you have most of the pith intact with the pomegranate. The pomegranate pith enriches the smoothie with fiber content and proteins, thus giving us another reason to go for it (12). The smoothie splash keeps you full for a long duration, in turn reducing the number of calories consumed by you throughout the day. In addition to this, fibers also help your body to stay detoxified while also maintaining a clean digestive tract. This low-calorie NutriBullet recipe is among the best NutriBullet recipes. The prepared smoothie will supply you with an excellent array of nutrients like 79 calories, 1.6 grams of fat, 165 milligrams of sodium, 8.6 grams of fiber, and 2.5 grams of proteins, that too with absolutely no cholesterol. How about a protein-rich smoothie which can turn out to be a perfect pre-workout drink and supplies you enough to stay full for an entire day? Sounds great, isn’t it? That is what this peach-kissed smoothie has to offer for you. The presence of Greek yogurt, almonds, and soy milk supplies ample amount of proteins to this recipe and make it rich in the nutrients. Not only do humans recognize these ingredients for their high protein contents, but the scientific data also shows that 100 grams of Greek yogurt contains about 10.19 grams of protein (13). Moreover, the soy proteins present in the soy milk have been widely recognized for their benefits, one of which is controlling obesity (14). This fantastic smoothie works best when consumed in the morning and provides you with 195 calories, 4 grams of fat, 62 milligrams of sodium, 4 grams of fiber, and 17.7 grams of proteins. In addition to this, it contains no cholesterol which makes it one of the healthiest NutriBullet recipes. Once the process is completed correctly, you have got a weight loss smoothie which can be consumed to achieve the required proteins before beginning with your workout session and enjoy a refreshing morning. Kale is one storehouse of the diverse range of nutrients that help your body to lose weight while keeping you full, using the lesser amount of calories. These nutrients are rich in vitamins including vitamin A, vitamin C, and vitamin K. In addition to these, Kale is also one of the most abundant sources of calcium, potassium, and contains plenty of fibers. Scientific studies have estimated that about 500 milliliters of Kale help your body to gain as much as 1 gram of each fiber and protein with just 16 calories. That is why it is a proven way to get rid of your problems of excess weight (15, 16). Thus, this combination of Kale and other weight loss alternates, like Blueberries and Greek Yogurt, in the form of smoothie serve as a help for the people battling with excess weight. The presence of Greek yogurt also makes it rich in fibers, hence adding to its overall efficiency. A large cup of this Kale and Blueberries smoothie helps you gain 270.6 calories, 18.6 grams of proteins, 37.1 grams of carbohydrates, 5.5 grams of fats, 335.5 milligrams of sodium, and 7.7 grams of fibers. This smoothie serves the purpose best when consumed in the morning. If your gut is messing up with your weight loss, then this is the magical drink that you should start consuming. The smoothie is prepared with some of the beneficial natural ingredients like spinach and pineapple. As we are aware that pineapple is one of those splendid fruits that support the body to lose weight, it is also something that makes up one of the necessary ingredients for the NutriBullet weight loss recipes. Another constituent, spinach, enhances the efficiency of this smoothie. It is scientifically proven that the spinach extracts which are abundant in the Thylakoids keep the food cravings away from the person for a longer duration of time as compared to the laboratory preparations meant for the same purpose (17). Thus, the combination serves as an outstanding way to control the weight gain or reduce it. This gut loving recipe also helps in keeping your gut happy and facilitating the weight loss process. The shake or smoothie is fulfilling and healthy owing to the presence of yogurt which is one of the most significant sources of probiotics. A large glass of this smoothie contains approximately 170.4 calories, 7.2 grams of proteins, 33.3 grams of carbohydrates, 4.1 grams of fats, 406.4 milligrams of sodium, and 11.6 grams of fibers. The Green color has been long associated with the positivity. We have brought the positive vibes to fulfill your awaited goal of weight loss. This green color comes from some of the weight loss boosters like spinach, parsley, peppermint, and cucumber. Recommended as one of the salad contents, Cucumber is said to be consumed before the meals. This is because this rich source of water supplies help the person to feel full, thus cutting the calorie intake (18). The other constituents also help the body to digest well and help the gut problems to stay away from your weight loss mission. A large cup of this smoothie will supply you with the nutrients such as 327.1 calories, 5.6 grams of proteins, 39.6 grams of carbohydrates, 17.5 grams of fats, 357.2 milligrams of sodium, and 10.3 grams of fibers. This refreshing combination of raspberry and yogurt in the form of a smoothie serves as a fantastic weight loss treat at any time of the day. The scientific studies have given significant support to the idea that yogurt is one of those amazing food items that works wonderfully in your favor if you aspire to lose weight. It also helps the body to stay healthy by maintaining an efficient gut function (19, 20). This is also something that makes the smoothie great in probiotic contents. In addition to this, the presence of raspberry in the recipe enriches it with the raspberry ketones. The raspberry ketones have been experimentally proven to facilitate the weight loss process. If you consume the smoothie as directed, you will undoubtedly move forward towards your weight loss goal. A large cup of this smoothie helps your body to attain 289.8 calories, 17.4 grams of protein, 17.9 grams of carbohydrates, 17.5 grams of fat, 269.8 milligrams of sodium, and 5.2 grams of fibers. This smoothie is the best one if you are looking for a low-calorie alternative to combat your morning hunger. The weight reducing capabilities of Kale are scientifically proven, and the experiments significantly support the folklore that says grapefruit is an amazing source if you want to lose the extra pounds from the body (21). Combining two great ingredients that boost the weight loss process, this smoothie is capable of supplying you with 152.7 calories, 5.6 grams of proteins, 32.2 grams of carbohydrates, 1.6 grams of fat, 385.8 milligrams of sodium, and 12.7 grams of fiber. You can also add some banana or honey as a natural sweetener if you experience a bitter taste. Snacking is the most confusing thing for anyone who is working to lose weight. While snacking is alluring at times, more of it will merely cause you to put on more weight and increase your problems. To counter this problem, we have a smoothie for you. This recipe will not only fulfill your snacking desires but will also help you solve your weight-related issues. The components used in the preparation of this smoothie include spinach, carrots, banana, berries, etc. A healthy snack will help you boost your weight loss process, unlike other meals which will take you to the opposite direction. Not only this, the ingredients supply you with enough energy to survive throughout the day; as a result, consuming lesser calories. Amazing, isn’t it? So, let’s get going. If you wish to reduce the sugar content of the smoothie, you can use filtered water in the place of coconut water. A large glass of this smoothie is abundant in the nutrients that include 170 calories, 2 grams of protein, 7 grams of carbohydrates, 16 grams of fat, 40 milligrams of sodium, and 2 grams of fiber. One of the initial steps to a healthy body is cutting on many carbohydrates you consume. Even though you must fulfill your daily requirements, you must also ensure that you do not end up consuming too much of them. This is the reason you must check the glycemic index of the food you have to determine the number of carbohydrates that your diet contains. It is also known that the food having high glycemic index increases the risk of type 2 diabetes in the consumer, hence posing a significant threat to our health (22). The fruits like berries have been proven to contain a low glycemic index and are said to improve the body’s reaction to the high sugar intake, thereby aiding the weight loss process by increasing the insulin resistance (23, 24). That is what makes this smoothie one of an ideal NutriBullet recipe for the diabetics. Moreover, the other ingredients it contains, like cinnamon, are also scientifically proven to reduce the obesity and help the diabetes patients (25). You can also add a bit of cinnamon to it for added flavor. This smoothie is best consumed in the morning time and wonderfully aids the process of burning fat. A large cup of this smoothie contains 188.8 calories, 5.1 grams of proteins, 38.5 grams of carbohydrates, 1.6 grams of fat, 472.7 grams of sodium, and 11.2 grams of fiber. The main reason that we opt for those unhealthy snacks between the meals is the feeling of an empty stomach that makes us crave for something to eat. Well, now we have another solution for you. The kale and strawberry recipe will help you feel full until your next meal so that you don’t opt for anything and consume healthy food as per your schedule. Not only kale, but even the strawberries act as a magical ingredient when it comes to fighting obesity and associated problems. The same arguments have been also proved through the clinical experiments. Besides this, strawberry also enhances the metabolism of the body thus stimulating the weight loss process (26). There is no challenge to the fact that the toxic elements present in your body form to be one of the most vital promoters of weight gain. While there are various ways, using which, you can detoxify your body, you can add one more to the list in the form of this detoxifying smoothie made from rich natural sources of nutrients. This recipe contains some of the well-known health boosting and weight reduction stimulating ingredients such as kale, cucumber, spinach, etc. What else enhances the potential of this smoothie is the presence of green apple. Green Apple is popularly known as an antioxidant. These antioxidants make it capable of fighting against the free radicals present in the body and induce the enzymes that aid detoxification (27). It has also been clinically tested to avert the symptoms of type 2 diabetes and stimulate weight loss in the obesity sufferers (28). It thus makes the NutriBullet smoothie recipe for the people who have diabetes and also helps to exhibit weight gain. No matter how much you hate kale for its bitter taste, you will still love this smoothie, thanks to the combination of strawberries, banana, and blueberries added to it. These fruits in addition to other ingredients, like Greek yogurt and vanilla extract will make you fall in love with the taste and benefits of this smoothie. Strawberries and blueberries increase the micronutrient and fiber content of the smoothie and make it capable of fighting the intoxicants in the body to regulate the gut functioning. The recipe gives a boost to the weight loss process and takes your body a few steps closer to the healthy being. The clinical study of various berries emphasizes the fact that they are rich in water content along with the fibers. Besides this, they are also one of the best suppliers of antioxidants, like vitamin C and vitamin E, thus making them potent options to combat the free radicals present in the body (29). This NutriBullet recipe not only aids the weight loss but also acts as an incredible detox option. In addition to this, it also promotes a healthy and problem free skin. This smoothie made from the natural ingredients, such as kale, romaine, cucumber, parsley, celery, and green grapes is a perfect blend of sweet and sour that helps your body in many different ways. While we are already aware of the lavish benefits offered by kale, cucumber, and parsley, it is also worth noting that the newly introduced ingredients are no way less in comparison. Celery is an excellent source of antioxidants, like vitamin C in addition to fibers, potassium, folate, manganese, calcium, vitamin A and iron along with many others (30). These nutrients are known for promoting weight loss by detoxifying the system. Besides this, the romaine is also generally one of the ingredients in the weight loss regimen and recipes owing to its corresponding value as an exceptional source of vitamin A, and vitamin C (31). This perfect combination of a fruit and a vegetable serves as a superb option to consume as a breakfast beverage. This smoothie not only combines the ingredients falling into various categories but also gets its richness from the blend of taste. While kale is bitter in taste, the fruity taste of kiwi and banana suppresses it with their tangy and sweet combination. The weight loss potential of the healthy NutriBullet smoothie is enhanced with the presence of kiwi and kale, which are among the most abundant sources of vitamin C. This not only helps you reduce your weight by eliminating the free radicals but also makes sure that you remain away from the ailments by enhancing your immune system. The addition of the coconut water fulfills the energy requirement of your body and helps you come out as a dynamic personality. This yet another green smoothie that includes the superb weight reducing ingredient known as Kale in combination with two fruits – Banana and Apple. As we know, these components serve as great detoxifying agents, and there is no doubt if the smoothie actually works or not. The principle of this recipe is quite simple; the removal of toxins allows the body to burn some fat to reduce weight. The next on our list of NutriBullet recipes for Weight loss is the smoothie that uses chia seeds in addition to the components we have already mentioned in some of the recipes. Some of them include spinach, kale, cucumber, apple, and lemons. While we have used chia seeds in various other smoothie recipes too, its time to combine them as the principal ingredient in this recipe. Chia seeds are one of those miracle ingredients which can be utilized amazingly to lose weight. And, the same has also been clinically tested for the purpose. They are one of the richest available sources of calcium, iron, and magnesium. The quantity of as small as one tablespoon is capable of fulfilling 7 to 9 percent of the mineral requirement of your body. In addition to this, it is a fabulous source of insoluble fibers and empowers itself to form a gel-like structure when it comes in contact with water, adding bulk to the stools and helping the body detoxify readily. Not only this, but the same property of chia seeds also keeps your body full for a reasonable amount of time, thus reducing the calorie intake by affecting the appetite (32, 33, 34). One serving of this zero cholesterol smoothie serves you with 101.6 calories, 2.8 grams of total fat, 51 milligrams of sodium, 18.3 grams of carbohydrates, 6.7 grams of dietary fiber, 7.5 grams of sugar, and 4.9 grams of proteins. A perfect breakfast addition to your diet, this smoothie has the richness of everything that you need to lead an energetic day ahead. Not only it has a peculiar taste where the fruits suppress the bitterness of kale, but it also ensures that you feel full for a more extended period. One of the best aspects of this smoothie is the presence of mangoes, which have a thermogenic effect when consumed. This is the reason that mangoes are powerful enough to increase the core temperature of a human body, causing more combustion of the fat contents. It also checks the secretion of the hormone known as leptin and decreases the appetite resulting in a decrease in the feeling of hunger for a more lengthened period. 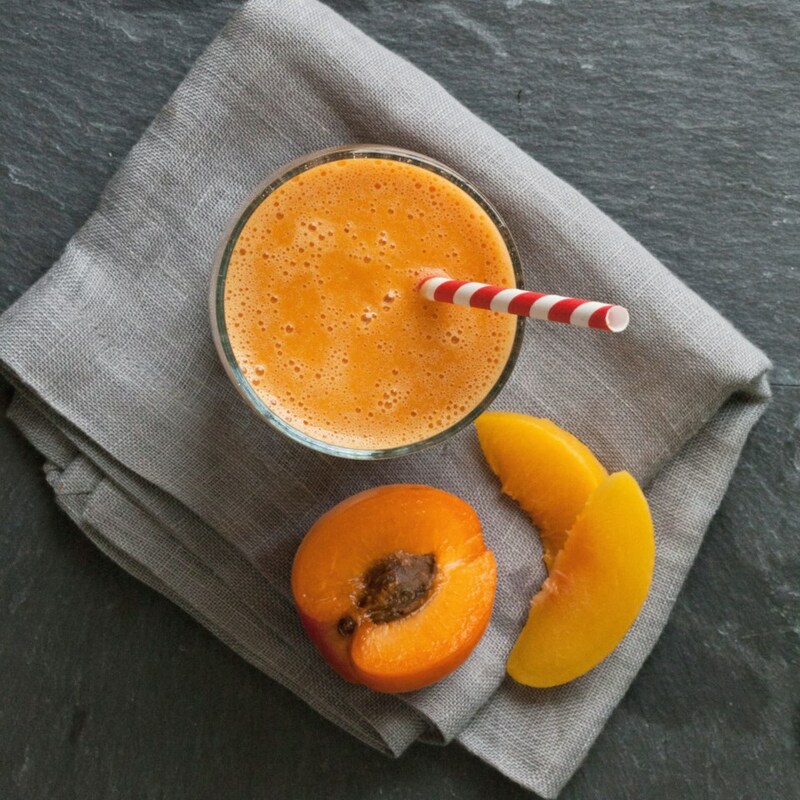 In addition to mangoes and kale, this smoothie also contains peaches. Peach fruit is known for its rich fiber content and helps your body to remain satiated for an extended time, reducing hunger. The shake is loaded with some considerable amount of native starch in the form of bananas that immensely help to regulate the increasing weight. The reason is that it is rich in proteins and antioxidants along with high fiber content that accelerates the metabolism and enables you to aid the process of digestion. Besides this, it is also one of the fruits that have a low glycemic index, which assists the body to get rid of some unnecessary fat. Another wonder ingredient of this smoothie is peanut butter. While half of you might disagree, but peanut butter can actually work wonders when it comes to weight loss. It makes your body to stay glutted for a long time, in turn helping you to cut the overall calorie intake throughout the day. Also, it makes the body to get rid of the saturated fat and promotes the monosaturated and polyunsaturated fats in the body. A large cup of this smoothie provides you with 366 calories, 18 grams of protein, 40 grams of carbohydrates, 3 grams of fiber, 32 grams of sugar, 16.5 grams of fat, and 151 milligrams of sugar. Note: The recipe is not suitable for the diabetes patients as it aids the rise in sugar levels in the blood. Detoxification seems to be one of the excellent solutions for the problem of weight gain. And what happens when we combine the strategy with an active ingredient that has been recognized for its potential to reduce weight, like, avocado? We are not the ones saying this, even the clinical studies have suggested that avocado is a high source of nutrients and is also beneficial for weight loss & weight management (35). A diet containing a medium-sized avocado supplies your body with a diverse range of ingredients including vitamin A, vitamin C, vitamin K, magnesium, and potassium. Avocados are also enriched with the phytochemicals that help the consumer’s body to remain in the prime of its health. Moreover, this fruit contains approximately 80% of water and dietary fibers and very less amount of sugar. This way, it helps your body to remain hydrated and also aids better detoxification and better support to the weight loss process (36). Some of the other ingredients that this smoothie comprises of, include spinach and apples. These have been scientifically proven for their weight reducing and health-boosting properties. 2. Chopped Spinach Leaves – 2 cups (without stems). You can also opt for using Kale Leaves instead. For those who are unaware of matcha tea, it is a powdered form of green tea. And similar to the green tea, this kind of tea is also a miracle ingredient that boosts the process of weight loss. It has the highest concentration of EGCG that helps the consumer as a catalyst to burn the fat and discourage the build-up of new fat cells. It helps the body to function more energetically. Besides this, the catechins in the tea promote more calorie consumption during the active workout, hence helping you to get the most out of it. Other ingredients of the smoothie such as pears and spinach increase the fiber and vitamin contents in the smoothie. The protein powder enables the body to remain satiated for a longer duration of time. A large cup of this smoothie helps your body to gain 389 calories, 7.8 grams of fat (saturated and trans combines), 205 milligrams of sodium, 919 milligrams of potassium, 12.1 grams of dietary fibers, and 42.4 grams of protein. Next is the watermelon smoothie. Watermelon reminds us of summers, isn’t it? After all, it is something that helps us getting relief from the long tiring summer days and keeps our bodies hydrated to beat the heat. Well, not only the fruit and its juice is useful, but you can also make a smoothie from watermelon. This smoothie possesses some refreshing effects in addition to being a weight loss option. It seems a perfect combination of health and stimulating experience. Watermelon is an astounding alternative for the ones who are seeking a healthy option with good taste. Containing only 30 calories in 100 grams, it gives you a diet that is free of cholesterol and negligible fat content. Besides this, it is also enriched with vitamin A, vitamin C, vitamin B6, and thiamine. The presence of yogurt in the smoothie enriches it with the calcium and vitamin D.
Pineapple can be a fabulous partner in your journey to a fit and healthy body. This rich and fleshy tropical fruit is a storehouse of many nutrients that have health-boosting effects on the body. Some of these nutrients include copper, vitamin B6, vitamin B1, folate, and pantothenic acid. In addition to these, pineapple is one of the richest sources of vitamin C, manganese, and fiber. These nutrients help the body to get rid of the intoxicants that form the barrier in the path of weight management and weight loss. It also accelerates the digestive tract that enhances the metabolism. Which, in turn, empowers the body to burn more calories stopping the formation of fat cells. In addition to this, the rich water content of the fruit helps the body to stay hydrated and keeps your body full for a longer duration of time. It keeps the appetite curbed and regulates many calories that you consume daily. A large cup of this smoothie is enriched with 271 calories, 1 gram of fiber, 30 grams of carbohydrates, 9 grams of proteins, 29 grams of sugar, 14 grams of fat, 1.5 grams of saturated fat, and 104 milligrams of sodium. This smoothie is prepared using two unique ingredients that prove magical when it comes to the weight loss process. You can combine banana and pineapple in multiple ways to reach a fruitful result, thus the first version of the smoothie. While the rich source of water in the form of pineapple helps you to remain satiated and hydrated, banana provides you with the native starch that supports weight management and weight loss. Besides this, bananas also help your body to overcome inflammation and cope up with the digestion problems. Also, bananas are one of the low-calorie foods and high in the proteins that help your body to cut the calorie consumption, that too with very less amount of fat. In addition to pineapple and banana, this smoothie also uses apple and spinach that in turn add to its effectiveness. 4. Spinach – 2 cups. You can also use Kale. Well, this is how you can combine banana and pineapple into a nutrient-rich smoothie along with some other ingredients to fulfill your wish of getting fit. Besides using pineapple and bananas that help you remain full for an elongated period during the day, this smoothie also uses some other ingredients that have proven weight loss benefits. These include yogurt and brown sugar, which helps you to enjoy a sweeter taste in lesser sugar content as compared to the white alternate. A large cup of this smoothie is potent enough to supply you with 200 calories, 2.5 grams of total fat, 1.5 grams of saturated fat, 35 milligrams of sodium, 37 grams of carbohydrates, 2.5 grams of dietary fiber, 9.5 grams of proteins, and 175 milligrams of calcium. Another option that we can consider as a weapon in our fight against extra weight is the orange and pumpkin smoothie that also has a hint of cinnamon. Every ingredient of the smoothie has its proven benefits when it comes to weight loss. For instance, orange juice is one of the richest sources of vitamin C. This nutrient helps the body to get rid of free radicals or toxins present within. It is also generally prescribed as a part of weight loss diet owing to the lesser amount of calories it has. Pumpkin also serves as a low calorie and high fiber alternate as compared to the other vegetables. It thus helps your body by increasing the fiber content in your diet that aids the process of digestion and detoxification. These properties make it one of the vegetables that can stimulate the weight loss process when combined with active workout. A large cup of this smoothie helps you attain 268 calories, 3 grams of total fat, 1.5 grams of saturated fat, 65 milligrams of sodium, 50 grams of carbohydrates, 2 grams of dietary fiber, and 12 grams of proteins along with 251 milligrams of calcium. The first thing that you need to abandon to lose weight is – the sugar-rich eatables. One such product is chocolates, which is also one of the most loved product. Well, going against the trend we are now combining chocolates with several other ingredients to prepare a phenomenal weight loss beverage. The chocolate soy milk in addition to the Greek yogurt present in the smoothie will help you overcome your food craving by keeping you full. Not only this, but they also help you fulfill the calcium requirements of your body. This smoothie also contains spinach that supplies your body with excellent fiber content along with vitamin B. This recipe also includes constituents such as avocados that help your body gain some healthy form of fats. So, now you can relish the taste of chocolates while ensuring that you do not go beyond the limits that cause you to gain weight. You can also add some chopped cashews and chocolate chips for garnishing, to enhance the appearance of this healthy smoothie. One large cup of this zero cholesterol smoothie is enough to gain 375 calories, 17.1 grams of total fat, 106 milligrams of sodium, 43.9 grams of carbohydrates, and 15.2 grams of proteins. Fruits always happen to be among the most abundant sources of nutrients that nature has blessed us. The smoothie that we are talking about is the one that has blended a wide range of fruits to form an incredible weight loss concoction. This smoothie works on the fundamental principle that aims at supplying the body with the required amount of fibers. It is because higher the amount of fibers you provide your body with (which should obviously be in the recommended range), higher will be your body’s potential to keep it free of toxins. It also contains a generous amount of proteins which not only helps you to feel full but also caters to the demands of your muscles, especially when you also have active workout added to your daily regime. You can also add some more components like swiss chard, arugula, or romaine to this smoothie, to make it taste better. A diet rich in protein has a lot to offer you, especially if you are someone who is looking for the solutions to lose some extra weight. Many researches and clinical studies have contributed to the belief that proteins ensure a faster weight loss process in comparison to other alternatives. Since proteins take more time to digest, they keep you full, thus suppressing the appetite and helping you by decreasing the food cravings. Besides this, it takes up more energy for the body to digest, which helps with the rapid fat oxidation and consumption of more calories (37, 38, 39). It also caters to the human body’s need for proteins for the muscle build up and repair when the body goes through extreme workout sessions. In addition to all these benefits, The protein-rich smoothie also improves your metabolism. A large cup of this zero cholesterol smoothie supplies your body with 328 calories, 12.5 grams of total fat including 2.1 grams of saturated fat, 143 milligrams of sodium, 40.8 grams of carbohydrates that consist of 4.8 grams of dietary fiber, 23.1 grams of sugar, and 17.4 grams of proteins. Keeping your body hydrated also works wonders if you are on the journey to reach the ideal weight. It is mainly because higher hydration levels help your body by reducing your appetite, increasing the Lipolysis. It also aids metabolism which has been widely recognized to assist the process of weight loss. It has been justified several times during the research performed on the rodents to determine the effectiveness of adequate hydration on the body weight. The result showed that keeping the body hydrated helps it to lose weight or the weight loss process speeds up due to the same (40). The smoothie is made using some of the tropical ingredients that contain an abundant amount of water. The primary function of this smoothie to keep the human body hydrated, which in turn supports to achieve your weight loss aim. A large cup of this smoothie helps your body to gain 245 calories, 0.7 grams of total fat, 103 milligrams of sodium, 1587 milligrams of potassium, 61.4 grams of carbohydrates, and 4.1 grams of proteins, that too with absolutely no amount of cholesterol. While many of the searchers recognize kale as one of the most effective ingredients that aid weight loss, this is another smoothie that helps you leverage its benefits. Pineapple has the presence of an enzyme called bromelain, which assists the body to digest protein. This smoothie also combines the advantages of some other ingredients that benefit your body in several ways to reach your weight loss goal, in addition to adding a flavor to the drink. A large glass of this wondrous beverage helps your body to gain 356 calories, 12.1 grams of total fat, 4 milligrams of cholesterol, 98 milligrams of sodium, and 15.0 grams of proteins. A perfect weight loss smoothie that combines sweet and sour ingredients to form a great blend of flavors. If you love the tangy strawberries and fresh bananas, it’s now time to mix them in a smoothie that is potent enough to help you through your weight loss regime. The smoothie also uses some of the other ingredients, like spinach, tofu, soy milk, etc., which help you boost the protein content in your diet. This smoothie is also loaded with the richness of almond butter, which is one of the richest sources of riboflavin, magnesium, and manganese. This nut butter is very beneficial for helping the body maintain a healthy metabolism. A large bowl of this zero cholesterol smoothie is enriched with 331 calories, 11.3 grams of total fat, 143 milligrams of sodium, 1580 milligrams of potassium, 45.3 grams of carbohydrates, and 16.1 grams of proteins. We are not telling you to go against the belief that, “fat intake increases the weight.” In fact, higher the intake of “unhealthy” fats like trans fat, and saturated fats, higher will be your chances of gaining weight. Moreover, you can be more prone to the risks associated with the cardiac problems. With this smoothie, we are just increasing your intake of healthy fats that include monounsaturated fats. The foods that are rich in the healthy fats can be a fantastic choice for the people who contain saturated or the trans fat. Besides being a helping hand in the process of weight gain, they also empower your body with an increased amount of good cholesterol (HDL) and decreasing the bad cholesterol (LDL). Which, in turn, keeps the heart safe from the diseases (41, 42). Consumption of healthy fats helps you stay full for a long duration of time since they take more time to digest. That’s how you can regulate your calorie intake too. However, even though it can prove to be a healthier alternative in comparison to the unhealthy fats, you must keep the consumption within specified limits. This cholesterol-free smoothie contains 309 calories, 19.9 grams of total fat, 59 milligrams of sodium, 25.5 grams of total carbohydrates, and 8.1 grams of proteins. Another healthy treat to bring life to your taste buds, in addition to the healthful benefits. This recipe is for the chocolate lovers, which allows them to continue their weight loss process, without compromising on the taste. It is prepared using the ingredients such as tofu, banana, spinach, soy milk, etc. This chocolate smoothie helps you gain enough protein for your body. That is why it keeps you satiated for long and hence cut on the total calorie intake throughout the day. Moreover, since proteins take longer to digest, they consume a lot of energy and burn more calories and fats, as compared to other alternatives. It is also one of those beverages that boost up your metabolism. It is a zero cholesterol smoothie which enriches you with 354 calories, 12.8 grams of total fat, 148 milligrams of sodium, 1162 milligrams of potassium, 40.2 grams of total carbohydrates, and 22.1 grams of proteins. It is a well-established fact that the best time to consume protein-rich diet is in the morning. Not only this, researchers have thrown light on the effectiveness of protein-rich breakfast to lose weight. They concluded that higher protein intake in the breakfast decreases the frequency of evening snacking habit. Thus, a breakfast which is rich in proteins is associated with enhanced satiety, reduced food cravings and an improved quality of diet, especially for the obese and overweight consumers (43). Let us explain how this protein-rich smoothie will help you to lose your weight. Besides this, it is also loaded with the benefits of blueberries that contain an unusual amount of phytochemicals, which are very fruitful to reduce the inches around the belly. It also includes an immeasurable amount of dietary fibers, vitamin C, and potassium. The smoothie also combines psyllium seed husk and flaxseed oil. While the former is a transcendent source of dietary fibers, the later one deals with the appetite by assisting to reduce it, burning the fat owing to its thermogenic effects. It enhances the metabolic system, and control the blood glucose levels. 1. Water – 8 oz.